to Placerville, California and the Grizzly Road leaves the Carson near Leek Spring Valley in California and goes to Grizzly Flat. 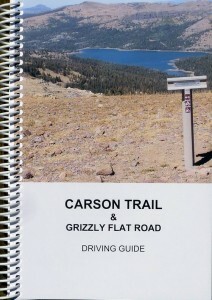 This is a 167 page guide that includes both the Carson Trail and the Grizzly Flat Road and is different from our larger guides in that it is intended to be a driving guide only and does not include photographs, quotes from emigrant diaries and other information that is included in our main guides. The historic Carson Trail is unique in that much of the original trail is still visible and can be driven over or hiked on. This distinctive feature allows the modern day user to visualize what emigrants experienced as they traveled over this trail. There are complete driving instructions and detailed maps to each Trails West marker and each marker is identified with GPS coordinates. A brief history of the trails are also included. For a photo tour of the Carson Trail click here.